I pride myself on making a good breakfast sandwich, but this Latke Breakfast Sandwich put every other sandwich I’ve made to shame. Sure, it takes some time to make the latkes, but if you’re looking for a truly special breakfast, look no further! 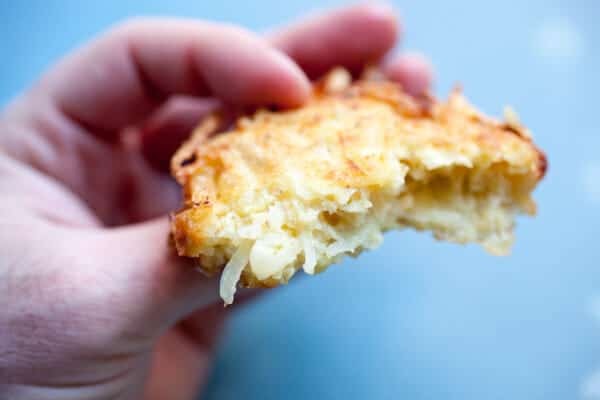 Making the latkes thin is a perfect replacement for the English muffin. They are super crispy on the outside and tender on the inside. The key ingredient to making these sandwiches truly shine: Jam. Strawberry or raspberry works well. The little touch of sweetness and fruitiness with the other ingredients is so addictive. Find a time in your schedule to enjoy a really special sandwich and start your day off right! 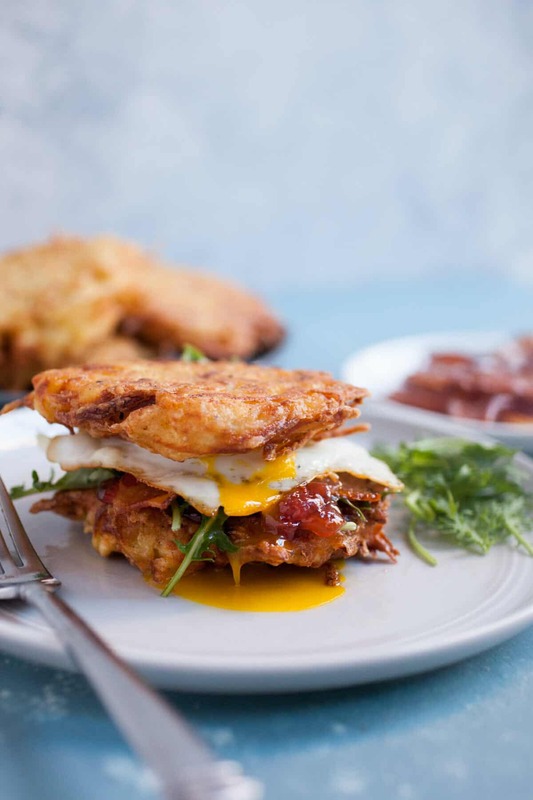 Thin potato pancakes sandwiched with bacon, greens, jam, and egg. 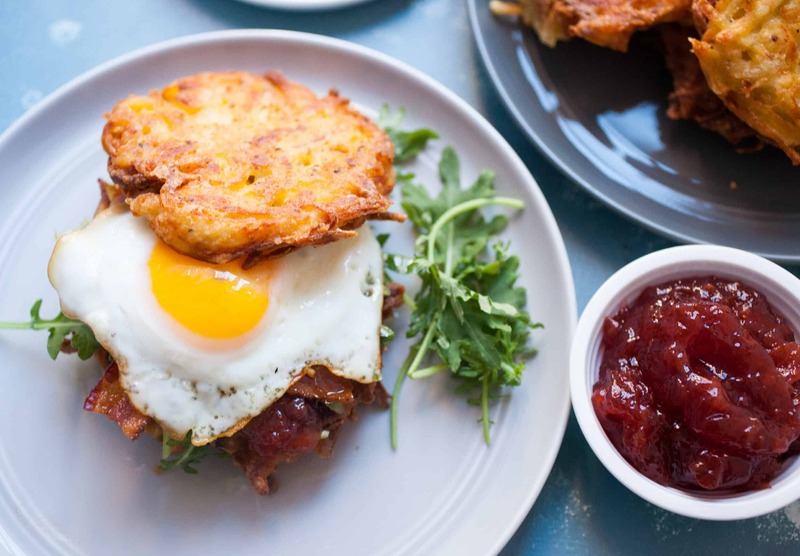 Pretty much the ultimate breakfast sandwich. Worth every minute of work! 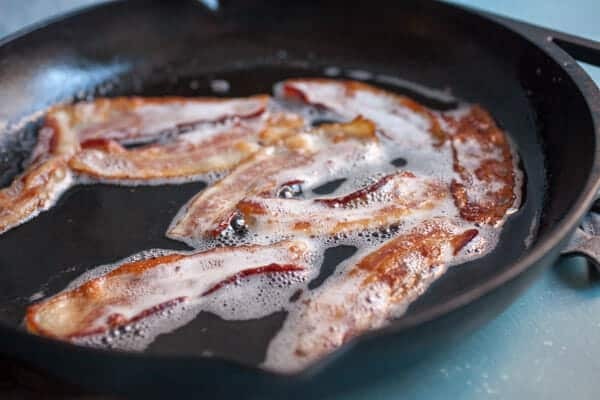 Cook bacon until crispy either by baking it at 350 degrees for 15-20 minutes, or cooking it over medium-low heat until it’s very crispy. Remove bacon and set aside. Meanwhile, peel potatoes and grate them using a box grater. Also peel and grate your onion. 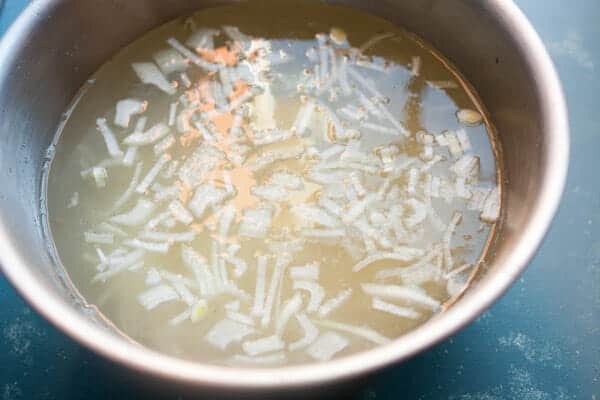 Add onion and potato to a bowl and fill with cold water. Swirl around to wash off as much starch as possible. Then drain and transfer potatoes and onion to a clean towel. 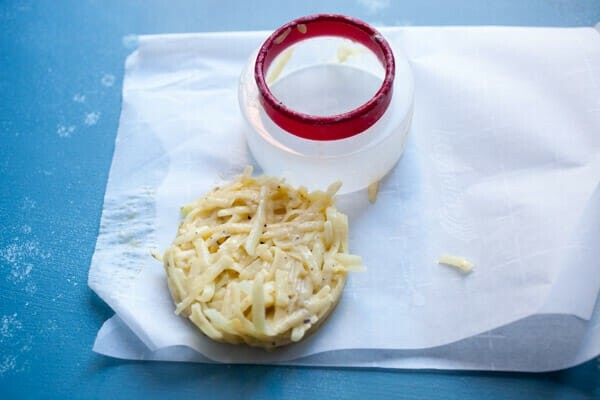 Wrap the towel up and squeeze out as much liquid as possible from the potatoes. Transfer dried potatoes to a bowl and add eggs, flour, salt, pepper, and baking powder. Stir to combine. Heat about 2 cups of oil in a large cast iron skillet over medium heat. Add a tester spoonful of latke batter to the pan. When it’s bubbling, you know the oil is ready. Make about 2-inch wide latkes (you can use a cookie cutter for precision if you want). Make them relatively thin. Fry latkes in oil for about 3-4 minutes per side until nicely browned and very crispy. Remove latkes and let drain. Meanwhile cook eggs over easy or however you like them. 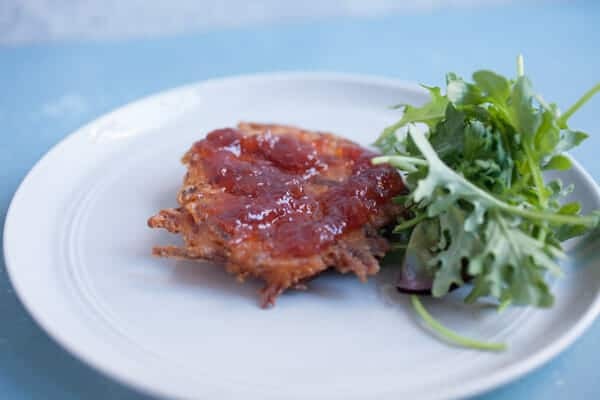 Make sandwiches by smearing a latke with some jam. Add greens (like arugula), bacon, egg, and another latke on top. CHOW DOWN! Basic Latkes from a NY Times recipe. Before we talk about the latkes, let’s make bacon. Sometimes I’ll bake the bacon, but I just needed a few strips for this sandwich so I just cooked my bacon over medium-low heat in a cast iron skillet until it was nice and crispy. 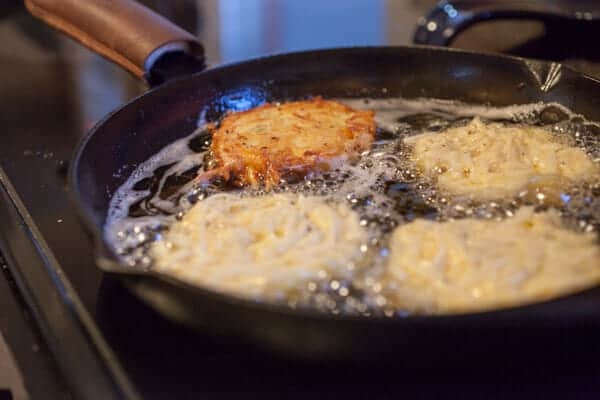 You can actually use the bacon grease to cook the latkes in later if you wanted to. You’ll need to add a little oil to them probably but it would be a tasty start. The key to good latkes (in my opinion) is grating the potatoes and onion and rinsing them really well to remove most of the starch. Peel and grate potatoes and onion and stir them in cold water. Then drain the potatoes and (most importantly) transfer them to a clean towel and wring out as much water as you can. You want the potatoes as dry as possible. 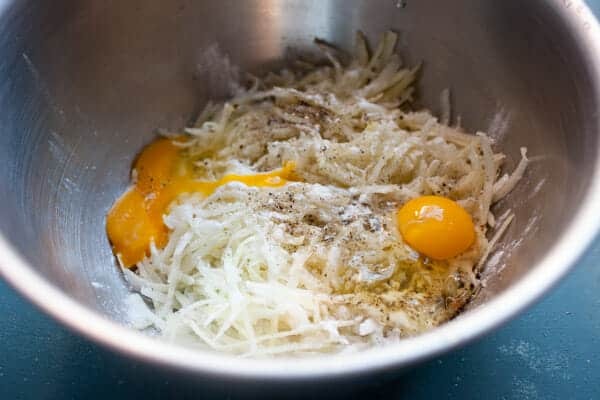 Then move them to a bowl and add the other latke ingredients. Get as dry as possible! I wanted to make really exact latkes so my sandwiches would be a standard size. You don’t have to be this finicky though. You can just eyeball it. Try to get them pretty thin. I used a cookie cutter as a mold for my latkes. Fry them in about 1/2-inch of neutral oil. Cook them for 3-4 minutes per side until they are golden brown. I had to test one right out of the pan. They were perfectly crispy on the outside and nice and tender on the inside. Good on their own. Better on a sandwich! Egg is a must for any breakfast sandwich! 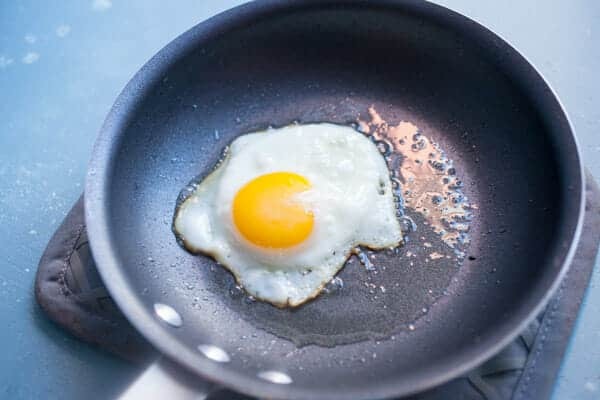 I cooked mine sunny-side up but you could do over-easy or poached if you wanted. When you’re ready to make a sandwich, start with a big smear of jam. I used a good strawberry jam. It totally makes the sandwich. Then pile on some greens (arugula is nice), crispy bacon, and egg. Raise your hand (or leave a comment) if you want this to teleport through your computer or phone into your life right now. OMG, cannot wait to make this recipe. I enjoy your site and your different take on food. This looks lovely and I’m sure it will taste great too. Hey, this is NOT kosher! But then I’m only half Jewish by my moms (the other half is black and likes bacon). You are correct. It’s definitely not! Ha!